Back in the early 1980s, the London-based Orbis Publishing Limited set out to cover the history of rock music, using an extensive series of magazines. I only have a few copies of The History Of Rock, but I’m pretty sure each issue was devoted to a particular topic or genre. 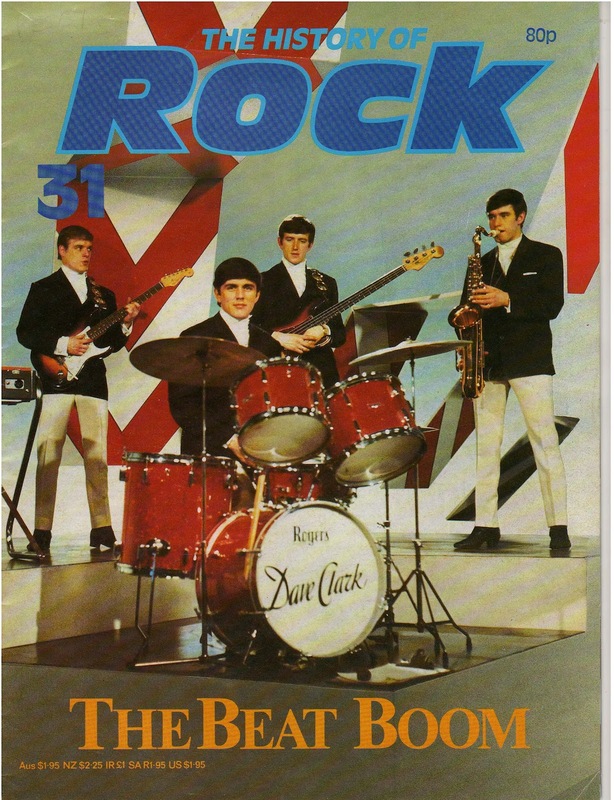 This one (Volume 3, Issue 31), which I bought on eBay decades after it first came out, covers the original British Invasion. It’s a relatively thin publication that seems more like one of those free inserts you get with Q, Shindig, or Mojo these days. It starts with page 601, which suggests that if you bought all the issues, they would comprise one continuous literary work. Also, like a book, there were no ads in The History Of Rock. Each issue cost 80p in the UK; $1.95 in the US and Australia. Binders were also available. Volume 3, Issue 31 was titled “The Beat Boom,” and featured an introduction by Stephen Barnard. He also wrote a closing piece on the role of traditional ballrooms in the rise of British pop music. Plus, there were stories on The Hollies, The Dave Clark Five, Freddie & The Dreamers, and The Tremeloes. The last page had a profile on American jazz artist Stanley Clarke under the heading “The Great Musicians.” It didn’t fit the issue’s theme, but maybe “The Great Musicians” was a regular feature. John Pidgeon’s piece on The Hollies describes “King Midas In Reverse”as Graham Nash’s masterpiece despite its disappointing sales; Alan Clayson recalls how The Dave Clark Five’s “Glad All Over” nudged “I Want To Hold Your Hand” from the top spot on the charts; and Peter Jones notes that “Silence Is Golden” was the first Number One for The Tremeloes. “The Beat Boom” overflows with eye-catching graphics and photos, making it a great collector’s item, even for those of us who don’t own the other hundreds of pages in the History Of Rock series. I have a set of these in binders, all 10 volumes with a total of over 2400 pages. I pick up a random volume now and then and lose myself in the pages for an hour or two, reliving my youth I guess.